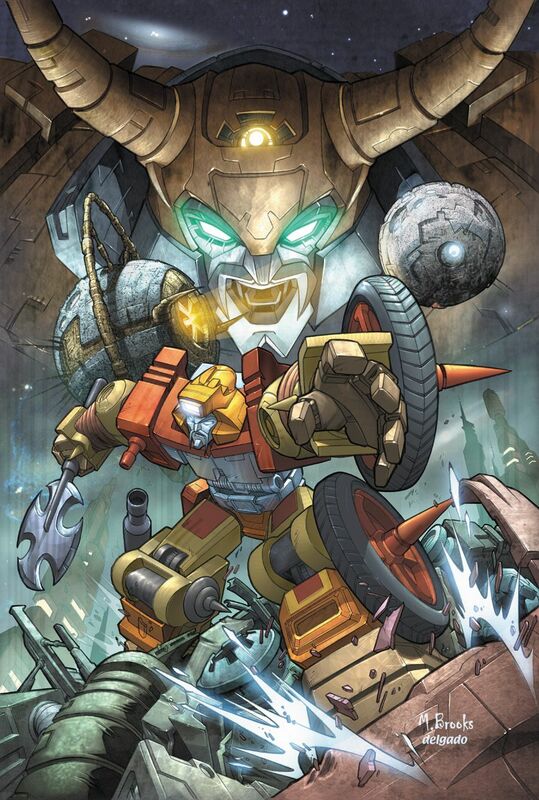 Character Bio -A leader among the Junkions, a strange race of transforming mechanoids that may have some connection to Cybertron, Wreck-Gar has often found himself allied with the Autobots. Despite his confusing manner of speech, consisting mostly of slogans from intercepted Earth television broadcasts, Wreck-Gar's valor and ability to repair injuries using nothing but scrap metal (likely a result of living in a habitat made up of piles of metallic detritus) have made him a valuable asset. Wreck-Gar is a double-spaced figure. As a Marvel figure, Wreck-Gar has these Marvel Synergies. As a figure with the Super Strength special power, Wreck-Gar has these Super Strength Synergies. Wreck-Gar's "Ninety Day Warranty!" special power allows him to heal adjacent Androids, Cybertronians, Junkions and vehicles. As a huge figure, Wreck-Gar interacts differently with these special powers. As a figure with the Super Strength special power, Wreck-Gar interacts differently with these special powers. Last edited by Ronin; April 1st, 2019 at 05:58 PM. Wreck-Gar does not take leaving engagement attacks. When moving normally up levels of height to move onto a space with Wreck-Gar, do not count a space for the first level. "ELIMINATE EVEN THE TOUGHEST STAINS!" When attacking an adjacent figure with Wreck-Gar's normal attack, roll 2 additional dice. If Wreck-Gar attacks an opponent's adjacent figure with his normal attack and at least one skull is rolled, he may attack an adjacent figure again. He may continue attacking adjacent figures, rolling 2 fewer attack dice for each subsequent attack, until you fail to roll a skull. Before moving, you may reveal an “X” Order Marker on this card to remove one Wound Marker from the Army Card of an adjacent vehicle, Android, Cybertronian or Junkion. After taking a turn with Wreck-Gar, remove 1 Wound Marker from this Army Card. Last edited by Zettian Juggernaut; April 2nd, 2019 at 05:31 PM. Last edited by Lazy Orang; March 24th, 2019 at 01:58 PM. Dropping the life to 7 would be my first tweak to consider. He's got the healing power in place and I'd like to see the mid-sized transformers at a lower base life then the big transformers. What are you looking at for the price range here? I kinda agree with YK. The healing bit will make him tough to take down already. That's a change I'm happy to make. It's worth remembering that 4 Defence at this price range is pretty terrible, though, but this kind of thing isn't unheard of (Wolverine, Spawn etc.). One other thing... are we happy with Absurd as the personality here? It fits him better than anything else I can think of, and I know there were plans to use it for the Brotherhood of Nada/Dada. Personally, I have no issues with a bit of funky synergy there, but I don't know those characters anyway so there's only so much I can say on that one. Definitely want to keep his class as Junkion, though - I feel that's an important bit of theme. A: The current bio isn't super accurate for G1 Cartoon Wreck-Gar, let alone one of the comic book versions. Personally I'd just do some silly talk tv style bio. It sums up the idea and Wreck-Gar doesn't really have a meaningful personality or bio to convey anyway. B: Wreck-Gar essentially doesn't exist in the American version of Marvel continuity, and he's only in the future timeline stuff in the UK, so I'm not sure if that matters for the publisher bit. I don't think Marvel UK has it's own logo, but IDK for sure. C: I don't really get what 'important bit of theme' the Uncle Istvan style class is supposed to convey. Mechanically it's just a still-born class that labels him as 'Starlord's bike'. Like couldn't he just be a 'Scavenger' or something? Something that has some remote room to go somewhere? I'd hate for this to set a standard where Bombshell's class is 'Insecticon' or Groove's is 'Protectobot', or Windblade's is 'Camien', or Leozack's 'Breastforce'... etc. (Also, I'd hate to have to follow through on this precedent and make Detritus a 'Junkion' instead of a 'Mercenary' on the incredibly unlikely chance he gets both comic history and figure enough to justify a card). If for some reason the word 'Junkion' just has to be on the card, you could just have it as his species. Junkions' having Cybertronian origins at all is sort of a vague 'ya, that's probably a thing' assumption for most continuities, and either way the whole 'living junk pile' thing seems like it would be enough justification for a different species considering dudes like Daredevil get that just for having bad eye sight. I kind of like the idea of Junkion being his species with class that has more re-usability. Not sure how much, if any, synergy will exist for the Cybertronian species though and if it's important for him to get included in it. So far there isn't any on the first two 'leader' cards, but it's being used here in the healing power. Outside of like specifically-the-mad-scientist-version-Shockwave, Jhaxius, IDW Sentinel Prime, Circuit Breaker, and like... Marissa Faireborne and Lord Zarak maybe?.. I'd be kinda hard pressed to think of anyone who could really need (or even justify having at all for the most part) a Cybertronian callout power*. And half of those probably wouldn't consider Wreck-Gar a real Cybertronian. * Only counting people with a snowball's chance of being made that is, and not like... Robot-Master or what-not. Yeah, that's kind of where I'm at with him but I only know him from the movie. I don't recall him popping up in the Marvel comic books I collected, and I wasn't sure what kind of presence he had in ones I don't own, but I feel like most of the Transformers universe characters we might make cards for don't need to be tied to him. For example, Ratchet might have some Cybertronian Healing/Repair power but then since Wreck-Gar already has a healing power himself he doesn't need it. Any of the human characters really don't need to play well with a guy who never came to Earth.